Subject: Antique print, untitled. 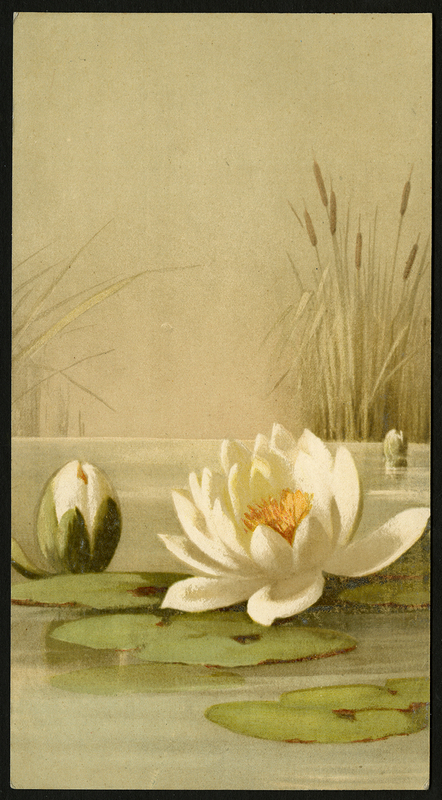 This print shows a water lily with cattails in the background. A text on the rear identifies this print as "no. 2, Nenuphars, serie 164, Collection E. Vouga". Condition: Good, given age. Collection stamp on reverse (A.C. Verhees, Den Bosch). General age-related toning and/or occasional minor defects from handling. Please study scan carefully. Medium: Chromo-lithograph on wove paper. Size (in cm): The overall size is ca. 13 x 24.4 cm. The image size is ca. 13 x 24.4 cm. Size (in inch): The overall size is ca. 5.1 x 9.6 inch. The image size is ca. 5.1 x 9.6 inch. Description: Published by Vouga, Geneva. Artists and Engravers: Made by 'Anonymous' after own design.